The recording oscilloscope PKT-1265 of the most recent generation features a high-resolution TFT-color display. Due to its high resolution of 800 x 600 pixel the operator can readout the measuring curves very accurately. The recording oscilloscope PKT-1265 is equipped with a USB-, VGA- and LAN interface, due to which large data volumes can be transferred to a computer without further ado in short time. It also allows connecting an external monitor and data can be requested wirelessly via the network. The data storage of the recording oscilloscope provides a capacity of 10,000 points per channel or 15 waveforms. But this data storage must not be used to all its capacity, instead the recording oscilloscope is able to store measured values and graphics straight on a USB interface. The maximum band width of 30 MHz and a high sampling rate of 125 MSa/s (per channel) enables several measurements at a broad application range. The recording oscilloscope PKT-1265 is already preset for 20 different automatic measurement functions and the TFT analysis. Due to the Autoset- and Autoscale- function of the recording oscilloscope a user-friendly operation can be assured. 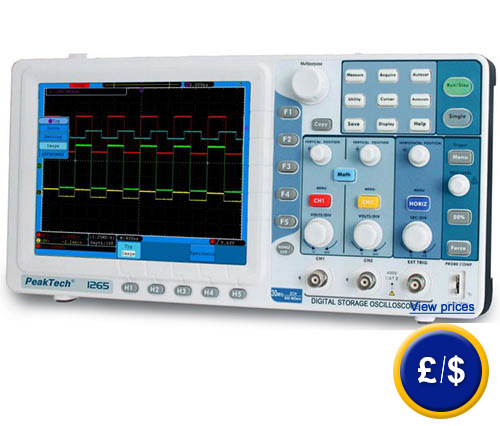 If there are any questions about this Recording Oscilloscope PeakTech PKT-1265, please have a look at the technical specification below or call: UK customers +44(0) 23 809 870 30 / US customers +1-410-387-7703. Our technicians and engineers will gladly advise you in all oscilloscopes and all products in the field of measuring instruments, regulation and control and scales.